Best Chinese Knives: Y-Start Jin02 EDC Axis Lock Knife Review from GearBest - Better than Ganzo G7533? Y-Start Jin02 EDC Axis Lock Knife Review from GearBest - Better than Ganzo G7533? For the comparison I used the very popular Ganzo G7533 model, which I received at about the same time. Overall fit and finish - pretty much the same level of quality, both have milled liners and excellent fit and finish, maybe a slight advantage for the Jin02. Mechanics and lockup - a clear win for the Jin02 - perfect centering, 0 blade play in any direction and much smoother action right out of the box (bearings in the pivot) give it a clear advantage over the Ganzo (even after I polished the washers on a Ganzo). Axis lock - is easier to disengage on the Jin, but it is also a bit stiffer and has sharper edges, so a tie at this point. Blade steel and shape - A slight advantage to the Jin, due to FFG (Full Flat Grind) shape, thinner grind and D2 steel (EDIT: later found out Ystart use 7Cr17MoV and label it as D2. Can't get much more for the price). Ergonomics - I personally prefer the Ganzo, it sits a little bit better in my Medium sized hand but the Jin is OK as well (it is individual). Pocket clip - If there is a weaker side on the Jin, it is it's pocket clip. Ganzo clearly takes this one, due to to the more stiff, pointy polished clip on the Jin. Also the Jin's clip creates a small "hot spot" in my hand while squeezing it hard in the hand. Verdict - the Jin02 is an awesome knife and will serve you well as an EDC blade. It's clear advantages are the mechanics, overall quality (especially in the details) and the better cutting blade shape. If you care about those things in the knife, you will probably like the Jin02 a lot. Thanks for the review, although for me, it's more of a PREVIEW. 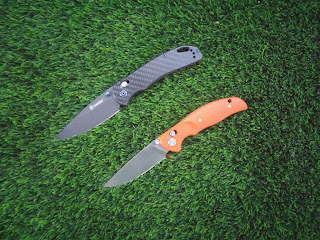 I have a couple of JIN02 knives coming from GearBest. They shipped a couple of days ago, and it takes some time to arrive from the other side of the planet. I'm amazed that Ganzo can pack so much value into their knives, and apparently Y-START is trying to one-up them on value. G10, bearings and D2 steel... at this price? It's nuts. Did yours arrive? How do you like them? I hate d2 steel because it rusts. Although the Chinese knives i have in d2 do not.therefore not real d2. I do in facy love the ganzo 440c steel. It holds an edge surprisingly well and is very corrosive resistant. There are Chinese knives with real D2 (for example my Green Thorn F95T). The Jin is probably not made with real D2 tool steel (it's true it doesn't rust), but with 9Cr18MoV, which they do sometimes call D2. Which IMO is even better (more suitable) than D2 for EDC use.